For centuries Germany has been named one of the most sustainable countries in the world. It’s no surprise to find they have named their first national natural landmark not too long ago. Where it is: The Ivenack Oak Park in Germany’s northeastern Mecklenburg-Western Pomeranian region. Forest Fact: The largest oak in the park is 3.49 meters (11.45 feet) wide and 35.5 meters tall and, based on its rings, is estimated to be up to 1,000 years old. 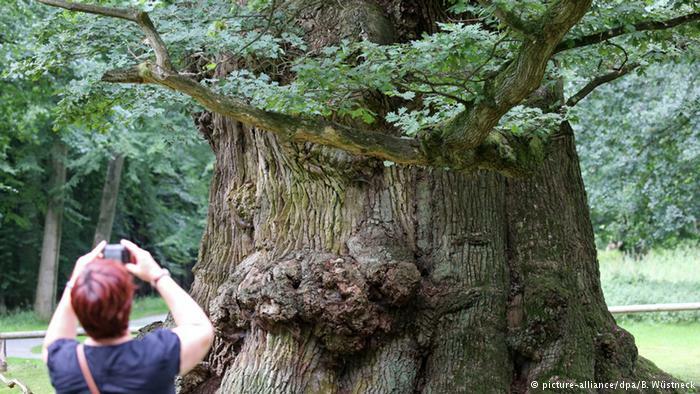 It’s considered to be the oldest and largest oak in all of Germany. As a luxury wide plank flooring company, we owe a lot to the trees & forests that supply our lumber; they are what make your floors possible. Here at Woodwrights Wide Plank Flooring we always treat nature with the dignity and respect it deserves. We never source from forests that have been clear cut – this is our motto and belief. Germany’s sustainability is an inspiration to all and is spreading throughout the world. Because of their care and love for nature, the forests we owe all of our success to will live on for years to come.